I found that quote pinned on a bulletin board at the Taoist Tai Chi Society nearly 20 years ago, and spent a decade trying to find the version of the Tao Te Ching it had come from. I found it in Stephen Mitchell’s translation, someone who deeply understands its principles, yet speaks them with a modern voice. it has been my favourite source of wisdom, insight, and perspective ever since. I’ve been having a lot of conversations lately about humility, leadership, selflessness, and non-striving. Showy glory versus moving behind the scenes and just getting it done. Lines from the Tao Te Ching keep coming to mind, but in conversations with people who have never even cracked a spiritual text. So, I’ve recently bought my friend a copy of this book, but know it would be a cruelty to just give him all this metaphorical verse and set him loose. Glancing at it, he’s already said: but it looks like poetry, I don’t like poetry. So to make this book a little more palatable to my friend, and a chance for you all to read along, I’m going to spend the next few months covering all 81 chapters, with a little expounding on what they mean to me and what I’ve come to understand of them so far (or what I’m still trying to figure out). 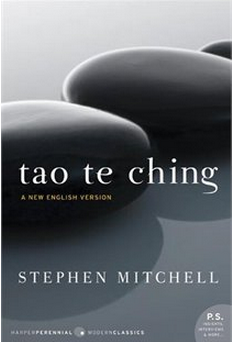 Go grab yourself a copy of this book (go on, you’ve got time, this project will take me well into the Fall) and read along with my friend and I, posting your comments and thoughts, as I share the Tao according to me – the Tao of V.
What’s on Your Fuckit List? This is what we do to find the truth of sacred writings. We read. We pause to reflect. We derive how the writing is manifested in our lives (or not). We choose to change (or not). We ponder and journey on. And if the writing has found a home in our heart/soul then we often return to it and start the cycle over again. So thanks for this opportunity and invitation to appreciate this sacred writing and see it from a different perspective.